Situated in the southern part of India, Karnataka comes with a reputation as a unique land packed with bustling cities, historical places and natural splendour. Home to a varied topography ranging from coastal area along Arabian Sea to high hills, the Western Ghats; and extensive plains, the state is also known for its historical past thanks to its being the centre of the Hindu Kingdom of Vijayanagara, on the Tungbhadra River, as well as the Muslim Sultanates of Deccan. The capital city of Bangalore serves as a base for exploring the state of Karnataka. While the medieval ruins of Vijayanagara at Hampi, mercilessly sacked by a coalition of Deccan Sultanates in the famous Battle of Talikota in 1565, cast a spell of charm, Bangalore retains the vestiges of the colonial era. 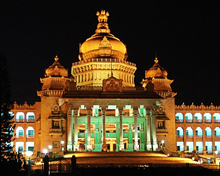 The gorgeous Vidhana Soudha, Karnataka's State Legislature and Secretariat building, is well worth a visit. Other cities with a distinctive class of their own are Mysore, Bijapur, Shimoga, Srirangapatna and Belgaum. Not to be missed are the famous 11th-century temples at Halebid and Belur, and the nearby Jain monolithic statue at Sravanabelgola. 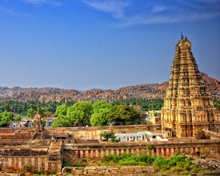 The host city of Hampi, once the capital of powerful Vijayanagara empire, is the famous UNESCO World Heritage Site in Karnataka. 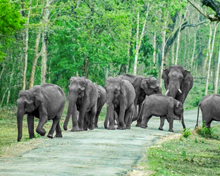 Bandipur National Park is the accepted haven for the wildlife lovers. Karnataka has a little bit of everything that India has to offer. The constantly pleasant temperature of the state makes it good year-round destination.